Welcome to Automata! Automata is a Tokeet platform application which allows users to automate tasks across their entire short-term rental business. Automata is based on Tokeet Triggers and adds more features and functionality to achieve greater and more granular control with automation. Automata is a Tokeet add-on, but it is not a standalone app. This means that Automata only works with Tokeet as of the first release. It may be extended to work with other PMS systems later. Automata Triggers are different from standard Tokeet triggers. They are not displayed in the Tokeet core application and users may only create and update Automata Triggers in Automata. Likewise, Tokeet Triggers do not display in Automata and must be managed via the core Tokeet application. Trigger Conditions: Automata adds a new feature to each Trigger called conditions. Conditions are checks that are made after an event occurs to determine if to fire the associated Trigger. More info here. Expanded Events, Actions, and Data Dictionary: Automata provides an expanded list of events, actions, and data dictionary variables which may be used in the construction of Triggers. This gives each user increased control over what they’ll like to automate. Custom Codes: Automata custom codes allow you to create you own data dictionary entries, and easily associate them with one or more rentals. This helps streamline guest communication over a large number of rentals. More info here. Workflows: Automata workflows allow you to organize triggers in a pre-defined sequence. You can create, view, and edit each individual trigger in order to customize your messaging for each rental and its connected channels. More info here. 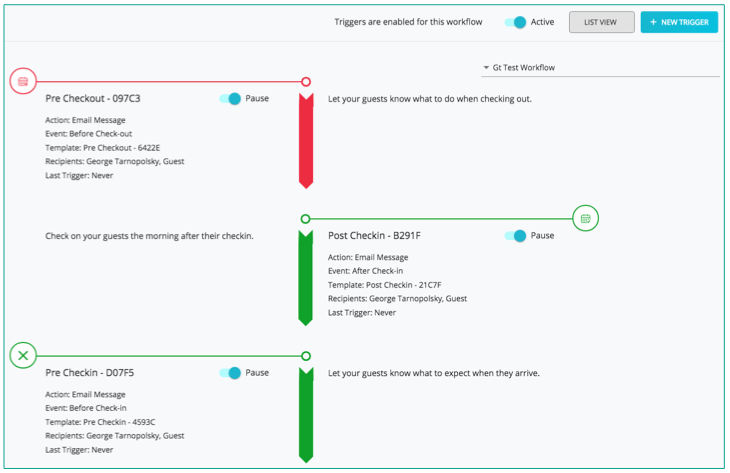 Sample Workflows, Triggers, and Templates: Automata allows you to select from pre-built workflows, triggers, and templates--greatly simplifying the process of configuring all your guest and internal communication. Multi-language templates: Automata allows you to seamlessly add translations to each template, and automatically respond to guests in their native language. More info here. Booking Exemptions: Automata allows you to skip or disable triggers for a specific booking, in order to further customize messaging for individual guests. You can create, view, and edit each individual trigger in a booking in order to customize your messaging for each guest. More info here. Integrations: Automata features both native Tokeet integrations as well as third party integrations (Zapier, IFTTT). Integrations allow you to connect Automata and native and external apps together in a nearly incalculable number of combinations, in order to completely streamline you workflow. More info here. There are many other options, tweaks, and configurations available to you in Automata. For now, these are the most important. Please contact us with questions any time! We are happy to help.